The only way to save the Ukrainian citizens from the Russian captivity is consistent international pressure and our unity, writes Mykola Tochytskyi. Ambassador Mykola Tochytskyi is the head of the Mission of Ukraine to the EU. Ukrainian filmmaker Oleg Sentsov will not come to Strasbourg on December 12 to receive Sakharov Prize for Freedom of Thought 2018. He will be still illegally imprisoned in the Russian city of Labitnangi and will keep fighting with Russia’s totalitarian system, on the verge of life and death. Oleg Sentsov opposed Russia’s illegal occupation of Crimea. He opposed the blatant violations of international law and cynical contempt for human rights. He stood for the right to free expression. He advocated principles and values, which are the core of the EU. Precisely because of this, on 10 May 2014, Oleg was illegally arrested in temporarily occupied Crimea, transferred to the territory of the Russian Federation and sentenced to 20 years in prison. The EU, its member states, Amnesty International, numerous politicians, human rights activists and artists joined Ukraine in its call to Russia for Sentsov’s immediate release. Ukraine, the EU and the whole democratic world consider the case to be in breach of international law and elementary standards of justice. In its recent Resolution of 14 June 2018, the European Parliament resolutely expressed its solidarity with Oleg Sentsov and demanded that the Russian authorities immediately and unconditionally release Oleg and all other illegally detained Ukrainian citizens in Russia and on the occupied Crimean peninsula. This year at the Ukraine-EU Summit, the leaders also called for an immediate release of Ukrainian political prisoners and their names were included in the text of the final declaration. Among them, there are Oleg Sentsov, Ukrainian journalist Roman Sushchenko and Crimean activist Volodymyr Balukh who is imprisoned in the occupied peninsula for hanging a Ukrainian flag over his house. Today it’s high time to remind the world about the issue of Ukrainian political prisoners in Russia and temporarily occupied Crimea. Sakharov Prize winner Oleg Sentsov has become a well-known symbol of the Kremlin’s political persecutions against citizens of Ukraine. However, as of today more than 60 Ukrainian citizens are illegally detained or imprisoned by the Kremlin under trumped-up and politically motivated charges. During 145 days Oleg Sentsov was on hunger strike. He advocated their release. He advocated justice, the right to free expression, freedom of thought and fundamental values at the cost of his health and life. It is impossible to explain to the families of Ukrainian political prisoners why in the democratic world of the 21st century we cannot stop Russia’s lawlessness political persecutions and return their loved ones back home. I believe that the only way to save the Ukrainian citizens from the Russian captivity is consistent international pressure and our unity. We must increase the price for Russia for its aggression. It is high time for the EU to respond by introducing sanctions against those who are responsible for ongoing large-scale human rights violation. We cannot allow Russia to enjoy impunity and lawlessness. to stop politically motivated persecutions of the Ukrainian citizens and immediately release Ukrainian political prisoners. The Sakharov Prize for Freedom of Thought 2018 is a reminder to all of us that respect for human rights is a fundamental value of the democratic world which must be protected and upheld. 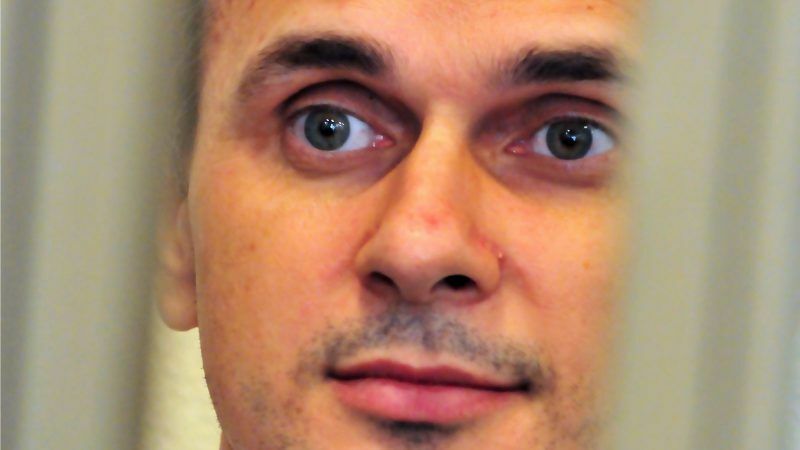 In his recent letter, Oleg Sentsov wrote: “I never surrender”. Ukraine will never surrender as well. We will keep fighting for the release of all political prisoners from Russian prisons. We count on the support of our partners and friends. We hope that solidarity and resolute common actions will finally bring results and innocent Ukrainian citizens will return back home to their families.